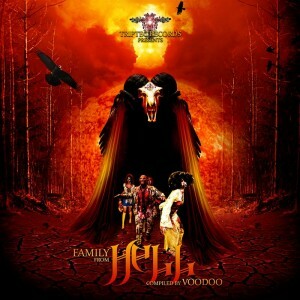 Compiled by Voodoo, Family From Hell is the latest brain-blaster from Triptec Records, Austria. With a focus on frantic high-tech beats, dark brooding atmospheres, and sick sound effects, this release is firmly rooted within the night music tradition. In addition, there are a couple of side trips into the twilight style as well as a sinister tribal techno finale. Mastered by Sergio Chaves at Meteor Burn Labs with artwork by Melancholic Wastage. MP3 Download | FLAC Download | WAV Download · Download count: 7,225. AND TO METEOR BURN LABS FOR THE MASTERING!!! nice bpm & hiqualty sounds !! i promote of japan !! thank you JUGEM for your support! All the best from TRIPTEC REC ! !